State Senators, Jennifer Boysko, D-Fairfax, left, and Sen. Janet Howell, D-Fairfax, watch a vote on a resolution that would bring the Equal Rights Amendment to the floor of the House. The resolution failed. A last ditch effort to get lawmakers in Richmond to vote on the Equal Rights Amendment failed today. It ends this year’s push to make Virginia the final state needed to change the constitution. 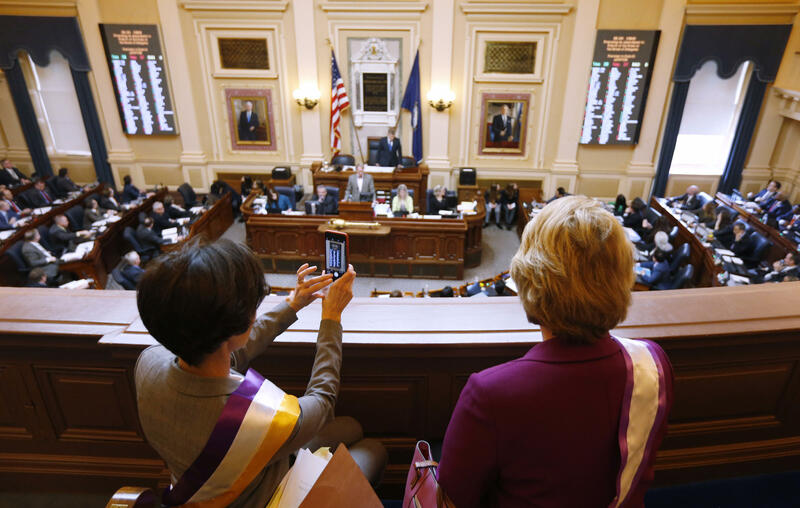 There was a feeling of sadness, fatigue and quiet determination as a group of women filed out of the House of Delegates Thursday. Many had been holding vigil for hours leading up to the vote. 11-year old Eastan Weber had been there since 5 a.m.
Weber, and others, held out hopes a handful of Republicans would switch their position and support a full vote on the Equal Rights Amendment. Many Republican lawmakers in the House say the amendment is a backdoor attempt to guarantee access to abortions. A lone member of the GOP, David Yancey of Newport News, voted for a full hearing. But in the end it wasn’t enough, and the resolution died on a tied vote. Carol Medawar of Fredericksburg was frustrated. A recorded vote means advocates can take information back to the voters. “The fury and the energy that we have as activist women will just carry forward,” said Andrew Weber of Powhatan. ‘Remember in November’ became the repeated phrase as the women exited the statehouse. All 100 members of the House of Delegates are up for reelection this Fall.